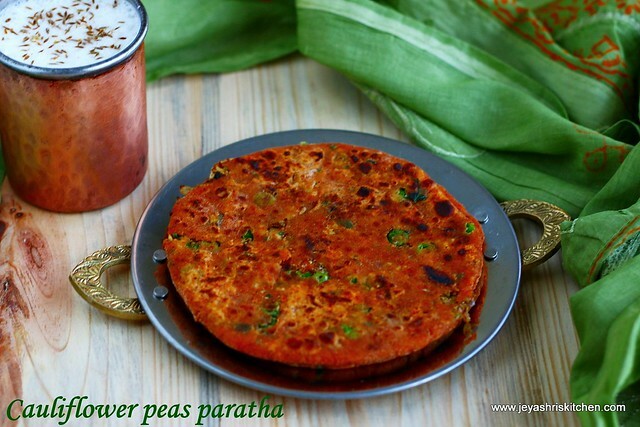 Punjabi Gobi mutter paratha is made with cauliflower and green peas. 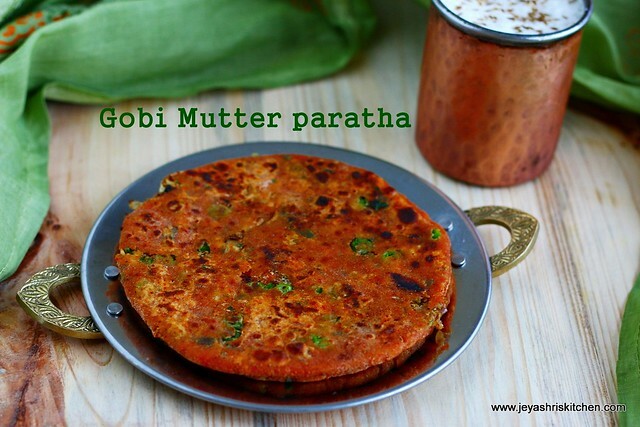 I have already posted gobi paratha, but wanted to post this winning combo of gobi and mutter. Since both cauliflower and peas are in season now, i thought it would be the right time to post this recipe. I made this bit spicy and flavourful by adding tomato puree and chili powder to the dough. The parathas turned out awesome and i packed few for my kids lunch and the i had also for my breakfast along with masala chaas. 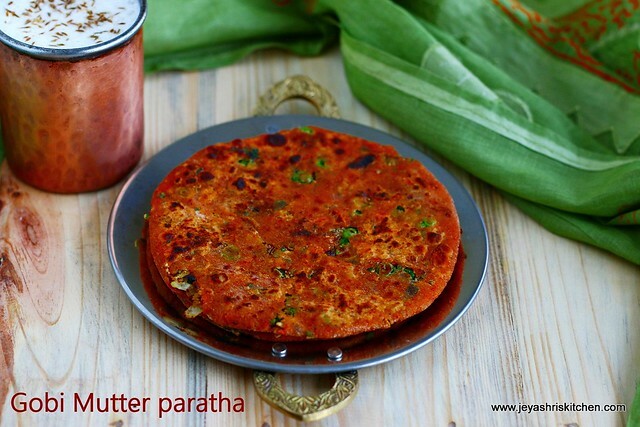 Do try out this paratha and let me know how it turned out. Follow jeyashris kitchen on instagram . Do send me the picture of the recipe you have tried from Jeyashri's kitchen. I will share that in jeyashris kitchen facebook page. Puree the tomato by grinding this in a mixie. Else you can use home made tomato puree or store bought puree. I grind one tomato and filtered the tomato juice to avoid getting the seeds into the juice. Divide the dough into equal big lemon sized balls. I wanted to make thick parathas and so i made it into mini orange sized balls. Meanwhile boil the peas in water for 5 minutes. I used frozen peas. 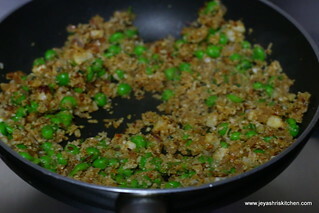 If using fresh green peas pressure cook for 1-2 whistles and drain the water completely. For both the peas, drain the water completely and pat dry it in a kitchen towel. This is to take the moisture out from the green peas, else stuffing will be watery and it will come out while rolling. Slice the onions very finely. In a pan add oil and cumin seeds. Grate the cauliflower in a small grater. It yielded 3/4 cup of grated cauliflower. Saute the onions for 2 minutes and add the grated cauliflower to the pan. Saute it for 2 minutes and add the red chili powder, cumin powder, coriander powder and paav bhaji masala. Add the blanched green peas too. Mix this well and mash this slightly with a masher and mix well. Let this cook on a high heat for a minute and then switch it off. The stuffing is ready for the parathas. Allow this to cool completely. Take one ball of the dough, dust it with flour and roll it into a small disc of roti. Keep 1-2 tblsp of stuffing on this. Bring all the edges together. Carefully close this properly and dust with little flour. Gently roll this into a paratha. I wanted a thick and little smaller paratha. So i rolled it like that. Heat a tawa and place the rolled paratha on the tawa. Cook this on both sides and add oil /butter/ghee on the parathas, once they are cooked on both sides. Repeat this for the rest of the dough. I have the filling left over for 2 more parathas. You can even use this as a filling for sandwich or make it as a kheema curry for rice too. Serve with any raitha or with lassi or masala chaas. Adding melted ghee or butter to the flour mix, while making the dough gives a nice flaky paratha. You can add ginger garlic paste in the beginning while making the stuffing. This paratha was not too spicy as i expected, so you can some more red chili powder either to the filling or to the dough, if you want it more spicy. You can add one mashed potato to the filling. Cauliflower can be replaced with grated paneer too and make a winning combo of mutter paneer paratha.